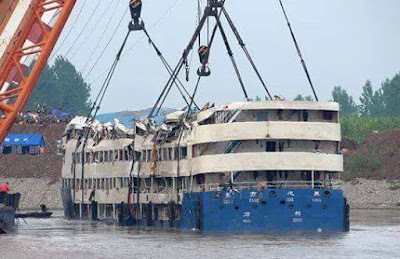 Last week Monday, the Eastern Star a passenger ship on a pleasure cruise along a stretch of the Yangtze in central China's Hubei province capsided during a storm. 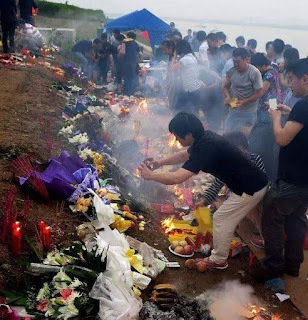 This tragic event left only 14 survivors out of an official passenger list of Four hundred and fifty six people, the rest of the victims mostly senior citizens perished at the bottom of the sea. So far 434 bodies have been found by search team, while 8 bodies remain unaccounted for in what has been described as the deadliest boat disaster China has experienced in 70 years. Forensic teams using DNA to identify the victims have only made 97 matches as at press time. State Authorities immediately took the Captain of the boat and its Chief Engineer into custody but nothing has been ascertained about the mishap apart from the fact that the boat was hit by a tornado. According to authorities the ship capsized around 9:30 p.m on Monday 1st June 2015 during a storm over the section of the river that flows through Hubei's Jianli County, authorities said. The captain and the Chief Engineer both said the ship had been by a "longjuanfeng" which can be translated as tornado or cyclone. 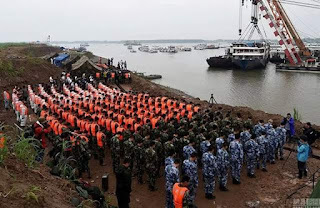 The rescue and recovery operation has involved 150 other ships,59 machines, 3,400 Chinese troops and 1,700 paramilitary personnel. Officials expanded the search area to i clude more than 600 miles downstream.